When you’re severely overweight, losing weight can be a real challenge. But with the help of a medical weight loss program you can easily find yourself back on the right path to health and wellness. Your medical weight loss program will help you lose weight, but your body still needs to engage in physical activity on a regular basis to sustain long-term results. A lot of people see physical activity as nothing more than an obligation, but this doesn’t always have to be the case. Fitness can actually be fun if you have the right tools and the proper mindset! 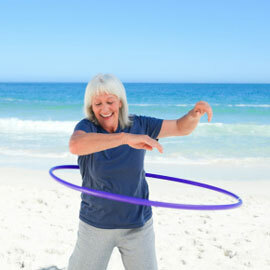 This summer all you need to lose weight and have a little bit of fun is a hula hoop! Hula hoop workouts are becoming increasingly popular in the Beverly Hills, Los Angeles and Bakersfield area. Typically, hula hoop workouts incorporate weighted hula hoops that are easier to control than many plastic hula hoops children play with, making it a great activity for adults of all ages. A heavier hoop is able to sculpt and reshape the body in all of the right places as most hoop workouts require constant push-pull contractions in your core muscles as well in your glutes and thighs. A study conducted at the University of Wisconsin discovered hula hooping can burn approximately seven calories a minute, for a total of 420 calories in an hour. Many people who struggle with weight gain have pain in their joints and bones. Hula hooping is an excellent low-impact exercise that won’t put excess stress on your joints. You can make up your own hula hoop workout or check out a local hula hoop class in the Beverly Hills and Bakersfield areas. If you’re interested in supplementing your medical weight loss program with hula hooping, here are five hula hoop workout tips. When hooping at home, remember to stabilize your legs and torso for the entire workout. As you hula hoop, only keep your midsection mobilized as you use your abdominal muscles and hips to keep the hoop rotating. Maintain proper posture and lift your ribcage as you stand up tall. Draw your belly in as if bringing your bellybutton closer to your spine, this will make it easier to spin the hoop. Before you begin spinning, make sure the hula hoop is parallel to the floor. Make sure your initial spin has good momentum to avoid a wobbly hoop. Expect your hoop to fall a lot in the beginning and don’t get too frustrated. When you feel your hoop start to drop, instead of rotating with the hoop, simply move your hips either front to back or side to side. If you try to rotate in sync with the hoop it is more likely to fall. Don’t give up! Hula hooping takes practice and the more you practice the stronger your core will become. Once your core strengthens you will find it easier to hoop and be able to incorporate new moves into your hoop workouts. Soon you will become a confident and skilled hula hooper. Add a little fun to your workout routine by introducing a hula hoop to lose weight. Hula hooping is a fun way to burn calories, stay in shape and maintain your medical weight loss results. So grab a hula hoop and start spinning!